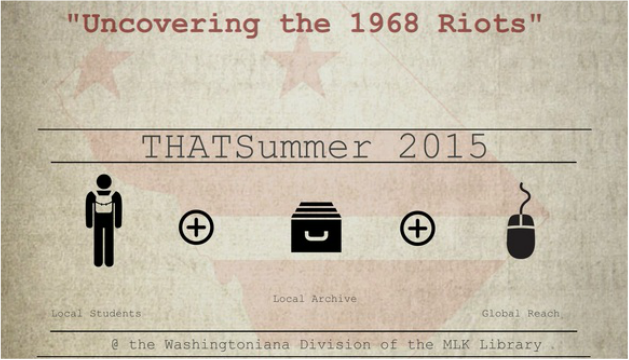 A 3-week academic program for 12 high school students to create an original digital humanities research project using archival materials about the April 1968, Riots in Washington, D.C. Trips will be taken to the National Archives and other local archives. For the final product, learners are responsible for the entire production process from beginning to end, though project facilitators provide feedback and guidance; no prior knowledge of the riots is necessary. Laptops will be provided for every learner. Participants are also encouraged to bring their own devices. Service hour credit is available – students will perform original scholarship of lasting benefit. Students will work together on a research project using archival materials housed within DC Public Library’s Special Collections. The goal of the project is to create and present an original story about the April 1968, Riots in Washington, D.C. using digital tools. Learners will work in groups of three to four to determine what they already know in order to begin, what they need to know to complete the project, and what next steps need to be taken along the way. At the same time two teachers and library archivists will make available a 'project briefcase' that points learners to helpful resources. They will leave 'breadcrumbs' for learners to follow, to uncover information, and to use during the project. Instead of a traditional classroom environment where teachers decide what to teach, how to teach, and when to teach, here learners will request to be taught specific information based on what they have determined they need to know in order to complete the project. What makes this learning process unique is that students create a story to tell about the archival materials they find rather than having a story told to them. Students will present their project at the 2015 DC Historical Studies Conference. A possible model for this effort could be the Alley Life project presented by our students at the 2013 Conference. As their presentation indicates, students engaged in this kind of work gain research skills and develop a positive, trusting, and meaningful climate in which to give and receive feedback and suggestions for learning and growth. Why the riots? The 1968 Riots in Washington, D.C. were a major local event with national importance and they are largely missing from the historical record. They are not mentioned in a majority of high school US History Textbooks, they are not part of DC History courses, and even the Wikipedia page about them is incomplete. Yet we know from the wealth of archival materials related to the riots that there is much to be learned and shared. Additionally, the topicality of racial tensions, policies, and violence given recent events adds to the urgency of this scholarship. The 50th Anniversary of the riots in Washington is also right around the corner. All from Washington Post April 5, 6, 7, 1968.